Epic Games has thrown down another round of challenges to complete in their latest Battle Royale update. Fortnite Season 8 Week 6 kicked off with a fresh set of tasks to finish which are spread across the island. And for those with the Battle Pass and an itch to collect everything from the current season, the additional Discover Challenge is a must. At some point in the future, Epic Games will reveal what collecting all the extra set of secret banners, Battle Stars and Loading Screens will reward player with. Every season has them, and they always lead to something worthwhile, like the evolving Prisoner skin that was directly tied to the big Season 7 finale. We’re not quite at that point yet in Season 8, and there’s still plenty to come before we move onto something new. And finding the new Fortnite Week 6 secret banner is pretty easy this time around, thanks to the help of those dedicated players and data miners. As usual, Epic Games will require you to complete all of the new Week 6 Challenges before you can unlock the secret banner location. This includes both free challenges that everyone can access and those special ones for Battle Pass owners. Having done all these tasks, you will find a new loading screen available to you in Fortnite Battle Royale. 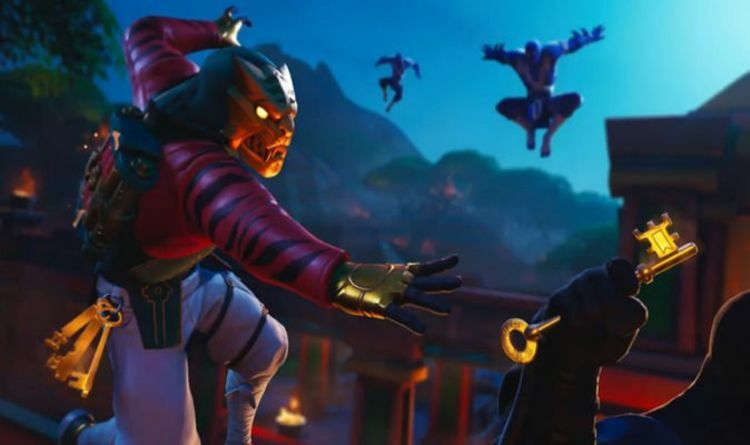 Week 6’s Loading Screen features Hybrid trying to pull a sneaky key capture while being chased by Ninjas. And the focal point for the secret banner location clues can be found on the big key, making it easy to work out where to drop next. The coordinates can be found on the bottom of the key, which lists them as E2, E3, F2 and F3. This means heading over to the northwest of Lazy Lagoon, near a Pirate Camp, which can be seen on the map. The location itself is a little different from what we have seen during Season 8 so far, and it’ll mean heading toward the woods to find the secret banner, which can be spotted just off the path. Due to its vibrant colours, it should be an easy item to locate among all the browns and greens in the location. And as mentioned above, there’s a good reason for finding all the special Discovery Challenge items. Doing so will mean unlocking a new skin, although we can’t be sure exactly what Epic Games has planned in Season 8.